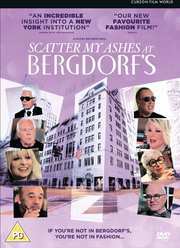 We like a good documentary, and Scatter My Ashes At Bergdorf's looks just that! Arriving on DVD format this coming 10th February, courtesy of the Curzon Film World label, this features frank, revealing and frequently outrageous interviews with Ashley & Mary-Kate Olsen, Nicole Richie, Joan Rivers, Karl Lagerfeld, Giorgio Armani, Tom Ford, Marc Jacobs and many others. With a 15 certificate, runtime of 94 minutes and extras that include extended interviews and a trailer, the recommended retail price for this release will be £15.99. Go behind the scenes of Bergdorf Goodman, New York's most exclusive department store in this glitzy, glamorous, insightful and truly breathtaking look at the luxury shopping destination of the stars. With interviews from the best in the fashion business and the store's dedicated, knowledgeable staff, this is a fascinating glimpse into a mecca of style and good taste.